We are happy to greet Peter Hiner (author of Zzzip) here in the forum! I think we have some questions to you about the Zzzip compiler so I started this new topic. How and when did you first meet the Enterprise computer? Did you write another programs, too? We heard about the Zzzip V2.0 but never seen it. Have you written it? Can it be found anywhere? Welcome in the forum again and have a good time here! We heard about the Zzzip V2.0 but never seen it. I think this is only a mistake in the program catalogue. But 1.2 version is exist! If Peter grant the rights to me then I will upload the softwares what I got from him. I do not remember any V2.0 of Zzzip but I have sent V1.2 to Zozo. Of course he has permission to upload it and also some other software that I have sent him. I am pleased that there is still some interest in Zzzip but worried that you have been using an earlier version for so long. I wonder what bug there was in the earlier version - there must have been some reason why I produced V1.2. If anyone found a bug, please let me know. I found (and sent to Zozo) a program called ZIPX, which I think might have been a version that included Basic Extension commands. I am sure someone will try this out and tell me what my program does! I remember that I started to produce a version of Zzzip that handled sprites but I don't think it was ever finished. Eventually I will try to find this and send it to you, but not until April. I explained to Zozo that I am going on holiday to Brazil to visit my daughter. Of course he has permission to upload it and also some other software that I have sent him. There is the Zzzip 1.2 with sources. I noted the source code slightly newer than the compiled version, the compiled version says a 1986 and the source is a 1987. If I think right, this is for the Boxsoft Basic extensions. Peter! These are also your programs? It seems that Pacman is also Peter's program. I am pleased that there is still some interest in Zzzip but worried that you have been using an earlier version for so long. I wonder what bug there was in the earlier version - there must have been some reason why I produced V1.2. If anyone found a bug, please let me know. I know about a "problem" though it isn't a bug I think. About twenty years ago I tried to compile the basic Pacman with Zzzip and it didn't succeeded, there were "too many labels". So I suppose you compiled the Pacman using the 1.2 version of Zzzip. All these games are mine : Pacman, Orbs, Galaxians and Tetris. That is to say, I wrote some Basic programs suitable for the Enterprise and then compiled them with Zzzip. Of course I did not invent the original games. When you say that you tried to compile Pacman with Zzzip but got an error message "Too many labels", then I do not expect that you were trying to compile my Basic program but another one. I do not think that the number of Labels was increased in Zzzip V1.2 (but of course I could always be wrong). The reason why I think that you were compiling a different version is because I did not usually distribute the Basic versions of my games as they were far too slow (in English we say that "It's like watching paint dry"). When you say that you tried to compile Pacman with Zzzip but got an error message "Too many labels", then I do not expect that you were trying to compile my Basic program but another one. It means that here in the rar file the basic program in the "source" directory ins't your work? And the Galaxians game we have also contains a "source" directory with a basic program. Anyway, I cannot find Space Orbs at the usual ep128.hu depository, only in the ep.homeserver.hu. I did not usually distribute the Basic versions of my games as they were far too slow (in English we say that "It's like watching paint dry"). The Orbs and Glaxians also have a Zzziped version and the originals. 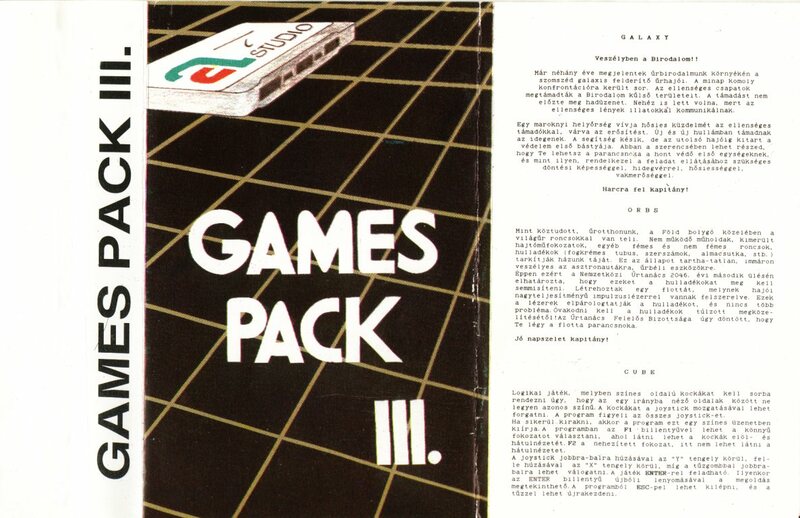 These are come on the Games Pack III. tape. I tried it and it doesn't work. The problem is that the elements don't really fall down. If the first element fell down it still wants to fall, the next element doesn't come. Are there any restrictions for the EP config? Now something came to my mind: many years ago I began to write a basic program and the compiled version was a bit different from the basic one: in the basic version there were some objects (characters) that didn't appear in certain cases. But in the compiled version these objects always appeared. (Their "appearance" was stored in variables. If a variable had certain value, one of the object didn't appear.) I don't know where this basic program is now though it was very primitive and didn't do anything interesting. Maybe it has any connection with the bug you spoke about? Now I tried to compile the PACMAN.BAS with both the 1.1 and 1.2 version, but all failed with the "too many labels" error. Now I tried many configurations in the emulator. The results: zzziped games not like too many RAM and ROM expansions. Especcialy when the German/Hungarian/Spanish ROM is present. As far as I can remember, the error message "Too many Labels" means that the Assembly Language file (created during passes 1 and 2) is using too much memory for labels (at this moment I can not remember exactly what the limit is or even why there has to be a limit). Most of the labels are used for Basic line numbers, so reducing the number of lines would obviously help. I don't have my Enterprise set up and working at the moment (and I really should not spend time playing with it when I have to get ready for my holiday). But in April I will try compiling these programs on my computer and see if I get any problems. I am also puzzled by the comment from szipucsu that Tetris does not work. It works on my machine without any problems. However the next post from Zozo might explain this. As far as I can remember, compiled programs will only work if there is a Basic ROM cartridge present - and of course in the days when Zzzip was written, there was only one Basic ROM - the English one. If that is correct, it would not be surprising that they did not always work when a different Basic ROM cartridge was present - in fact it would be surprising if they ever worked. I guess that the full explanation might be that the compiled program only uses the Basic ROM for certain functions, and therefore it would work sometimes but not in all cases. For example I am beginning to remember that Single Dimension Arrays were given special treatment by Zzzip, so that they would run faster - this meant that Zzzip created completely independent code in the compiled program to handle these arrays. However arrays with more than one dimension were handled by calling the appropriate subroutine in the Basic ROM - so they were not speeded up as much, but the benefit was that I avoided a large increase in the size of the compiled program. I expect there were some other functions that were treated in the same way.